Box Text: This can't be! There has never been a Great White in these warm tropical waters before. NEVER! This is more than a coincidence...this shark appears to be possessed...as if it's hunting you down...like it's personal. You'd better prepare yourself and strike back before it's too late. Will you use the mini-sub, sea plane, sail boat or just scuba gear? Perhaps it won't even matter. Remember, this is some kind of unbelievably powerful eating machine you're dealing with. Quick, grab your weapons, pack your explosives and check your maps. It's out there...you know it...and it's coming for you. This is serious! 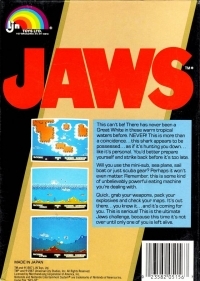 This is the ultimate Jaws challenge, because this time it's not over until only one of you is left alive. 11-11-2013 pacpix Box Text This can't be! There has never been a Great White in these warm tropical waters before. NEVER! This is more than a coincidence...this shark appears to be possessed...as if it's hunting you down...like it's personal. You'd better prepare yourself and strike back before it's too late. Will you use the mini-sub, sea plane, sail boat or just scuba gear? Perhaps it won't even matter. Remember, this is some kind of unbelievably powerful eating machine you're dealing with. Quick, grab your weapons, pack your explosives and check your maps. It's out there...you know it...and it's coming for you. This is serious! 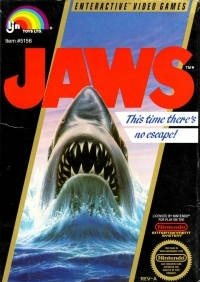 This is the ultimate Jaws challenge, because this time it's not over until only one of you is left alive. 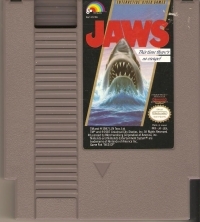 This is a list of VGCollect users who have Jaws (round seal) in their Collection. This is a list of VGCollect users who have Jaws (round seal) in their Sell List. This is a list of VGCollect users who have Jaws (round seal) in their Wish List.